Michael Dunlop at Ballaugh Bridge on the Team Classic Suzuki XR69 during Superbike practice for the Classic TT races on Tuesday. Michael Dunlop set the pace once more at the Classic TT as the Ulster rider lapped at more than 122mph on the Team Classic Suzuki XR69 to lead the Superbike times on Tuesday. Dunlop, who clocked 121mph during opening practice on Monday, increased his speed to 122.650mph from a standing start, despite less than perfect conditions on the Isle of Man with Clerk of the Course Gary Thompson reporting damp patches under the trees. The Ballymoney rider completed a second lap, but cruised around at a relatively sedate 116.996mph by his standards. The session had been under threat due to the weather but a late decision was made to press ahead after low mist reported on the Snaefell Mountain earlier in the day finally lifted. Bruce Anstey, who is expected to pose the biggest threat to Dunlop’s bid to retain his Superbike crown, was an early retirement at Barregarrow on his opening lap on the Valvoline Padgetts Yamaha YZR500. Bradford’s Dean Harrison went second fastest on the Silicone Engineering Kawasaki at 121.101mph as he edged out British championship frontrunner Michael Rutter, who clocked 120.763mph on the Harris Yamaha ridden last year by Ryan Farquhar. 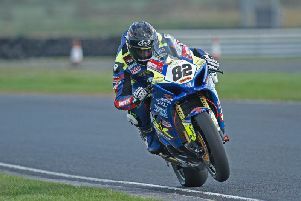 The Dungannon man misses out this year as he recovers from the injuries he suffered in a crash at the North Wet 200 in May. Rutter also managed a second lap, which was slightly slower than his opener at 120.163mph. Mistral Kawasaki’s James Hillier was fourth quickest (120.336mph) ahead of Ivan Lintin on the Devitt RC Express Kawasaki, who set his fastest lap of the night at 120.160mph. Manx rider Dan Kneen completed the top six with a lap of 118.112mph on the Mistral Kawasaki. William Dunlop, riding a Kawasaki ZXR750 for Herheim Racing, was 11th fastest at 115.557mph. In the Lightweight Classic TT session, which ran concurrently with the Superbikes, Welshman Ian Lougher improved marginally on Monday evening’s time to top the board again at 113.893mph on his second lap of the session on the LayLaw Racing Yamaha. Phil Harvey (107.649mph) and Paul Owen (103.405mph) were second and third fastest respectively. Shaun Anderson, riding the CB Racing Honda, was fifth quickest at 102.420mph. Morecambe’s John McGuinness, fastest in the Bennetts Senior session on Monday, was an early retirement on the Winfield Paton at Ballacraine. As the weather began to close in, most of the competitors managed to complete some vital qualifying laps and it was last year’s winner Harrison who topped the leaderboard on the Black Eagle MV Agusta at 107.041mph from McGuinness’s team-mate on the Paton, Conor Cummins, who managed a speed of 104.857mph. Jamie Coward on the Ted Woof Norton was next at 104.628mph ahead of Alan Oversby on the Davies Motorsport Honda (103.815mph). Veteran racer Rutter continued his dominance of the Okells Junior Class on the Ripley Land Racing Honda, setting the only lap in excess of 100mph in the class on Tuesday evening at 100.182mph to take the top spot from Northern Ireland’s William Dunlop (Davies Motorsport Honda), who lapped at 96.885mph. Michael Dunlop, filling in for the injured Lee Johnston in the Black Eagle Racing team, was sixth on the MV Agusta (93.244mph). Meanwhile, Isle of Man riders Andrew Dudgeon and newcomer Michael Evans impressed during second qualifying for the IMGold Manx Grand Prix. Ramsey resident Dudgeon posted the fastest time of the evening at 116.906mph on the GSX-R Suzuki that he will ride in the MGP Junior and Senior races next Wednesday and Friday. Andy Farrell wasn’t far behind at 116.290mph with Tom Weedon third fastest and also into the 116mph bracket to round out the top three in the Junior class. Manxman Michael Evans topped the Newcomers A leaderboard at 110.059mph. Dan Sayle continues to dominate the Lightweight/Supertwins class and his best lap of 104.385mph was almost 45 seconds quicker than his nearest rival. Alan Cunningham and Gavin Brown were reported to have been involved in an accident at the 32nd Milestone. Brown was unhurt but Cunningham was taken by airmed to Nobles Hospital with suspected chest injuries.